PHOENIX, ARIZ. (March 9, 2015) Phoenix Fashion Week kicks off its 2015 series of events this month by teaming up with Downtown Phoenix’s own Arizona Center for the sixth-annual “Spring into Style” runway showcase. 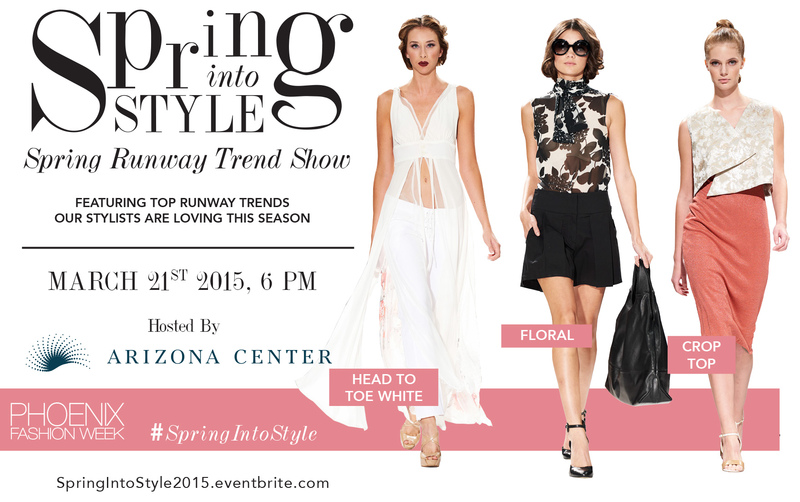 Hosted by Arizona Center, “Spring into Style” serves as a tribute to top stylists and showcases on-trend spring fashions set to the sounds of internationally-renowned DJ Q. On Saturday, March 21st, starting at 6:00p.m. with ‘The Taste of Arizona Center’, guests will have the opportunity to sample the best bites from local Arizona Center restaurants. Guests will also be treated to a fashionable outdoor Meet & Greet Mixer, where they will be able to shop stylish local pop-up shops with the backdrop of beautiful Downtown Phoenix, including: State Forty Eight, Amber’s Closet, Dillards at Paradise Valley, Nazila Couture, Shazia*s Boutique, Customs Kreations, Rhinestones & Relics, Ruby Mae Jewelry, Ashley Lane Company, European Wax Center, and DeVita International. Media can enjoy a luxurious Log-In Lounge experience with luxurious furnishings provided by Mark Taylor, presenting modern luxury at four exciting new communities: @51, Domus, Level at Sixteenth in Phoenix and Crescent Scottsdale Quarter. Attendees can take in an interactive spring fashion show in the lush courtyard featuring hair and makeup by Salon Estique beginning at 8:30pm, followed by an after party directly following the show, hosted inside 1130 The Restaurant. “Our team is excited to again offer a unique and popular fashion event to the heart of downtown Phoenix. Last year, it was a sold out event and with these very talented (6) stylists, we anticipate it being a hard ticket to get this year,” said Brian Hill, Executive Director of Phoenix Fashion Week. This special runway show serves as one of several preview events produced by Phoenix Fashion Week in anticipation of the Fall event scheduled to take place October 1 – 4, 2015 at Talking Stick Resort. Event partners include: Arizona Center, 1130 The Restaurant, Boom Digitus, Mark Taylor and Salon Estique. Tickets are available to the public for this event and can be purchased online at http://springintostyle2015.eventbrite.com/ or $40 for Style Seats and $125 for VIP Front Row. All tickets include access to official “Taste of Arizona Center” and the After Party. – ‘The Taste of Arizona Center’ starting at 6:00pm – sample delicious bites from restaurants at The Arizona Center. – After Party at 9:30p.m. A shopping, dining and entertainment destination in Downtown Phoenix, Arizona Center is an urban oasis with lush gardens and tranquil courtyards. The mixed-use corporate and retail space is owned by Common Wealth REIT, a real estate investment trust who primarily owns office and industrial properties located throughout the United States. The property is managed by CBRE. For more information about Arizona Center, visit http://www.arizonacenter.com. Phoenix Fashion Week is the leading fashion industry event in Arizona. The organization’s mission is to bridge the gap between national and international designers and premier retailers and prestige fashion media. Phoenix Fashion Week’s ultimate goal is to garner global exposure for Arizona’s fashion industry. Through educational fashion seminars, year-round fashion events, and charitable partnerships, Phoenix Fashion Week is gaining rapid acclaim for its community-service efforts and for infusing world-class innovation into the Southwest. For more information, please visit http://www.phoenixfashionweek.com. SOCIAL MEDIA: Media covering Phoenix Fashion Week, posting stories, and live blogging from the the event, are encouraged to use Phoenix Fashion Week’s official social media handles and hash tags: @PHXFashionWeek and #phxfashionweek, as well as #SpringIntoStyle for this specific event. Jennifer Aniston’s safety blanket LBD was MIA on the Critics Choice Awards red carpet, and we couldn’t be more thrilled! Opting for a sleek, cut down to there Gucci tuxedo suit in the Pantone Color of the Year – Marsala, accessorized perfectly with a delicate gold lariat necklace and burgundy Louboutin pointy pumps. Word on the street is Jen wants to break out of her typical red carpet looks and has partnered up with Lupita’s stylist, Micaela Erlanger and all we have to say is: what a match made in fashion heaven.